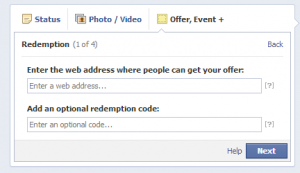 Make your SimplyBook.me promotion viral, using Facebook offers ! Recently you may have noticed offers popping up on your Facebook news stream where your friends have been accepting various offers from companies in the neighborhood and on the net. The great thing about these Facebook offers is that they can easily be used in conjunction with the SimplyBook.me promotions plugin to get your promotion going even faster. First of all you should create your promotion on SimplyBook.me. Select the applicable services, time of offer and validity of promotion and take a copy of the promotion code and do not include it in your SimplyBook.me message, because this code will be used in your Facebook promotion. Take care NOT to send/save your offer yet on SimplyBook.me because you might want to create your message in a way so that your existing clients actually visit your Facebook offer post, claim your offer there so that the offer spreads faster. When you have created your promotion on SimplyBook.me, you go and create it on Facebook. You should take care to use same constraints of offer validity as you did on SimplyBook.me. Now when the offer has been created and posted on your company profile, copy the link to this Facebook offer in to your message that you will send to all your clients registered at SimplyBook.me. Tell them that the offer is now available on the Facebook post, and ask them to claim it there, get the code and then go to SimplyBook.me to book the appointment with the discount that you offered in this promotion. Your clients will now advertise your promotion to all their Facebook friends and you will get a faster response to your promotion. Of course if you want to keep your promotion private to only your existing clients, you would simply send it directly using SimplyBook.me promotions and include the redeem code in that message !